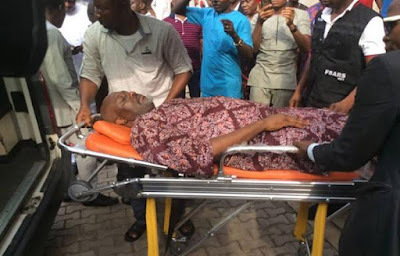 Human rights lawyer, Mr. Femi Falana (SAN), has lambasted the Nigeria Police for arraigning Senator Dino Melaye in court on a stretcher. Falana said in a statement on Thursday that the degrading and humiliating treatment meted out to Melaye was a violation of his fundamental human right. “The arraignment of Senator Dino Melaye on a stretcher in Abuja on Wednesday and Lokoja on Thursday morning is unacceptable in a civilised society. Falana, however, stated that Melaye’s ordeal was a reflection of the suffering ordinary Nigerians faced in the hands of security agents on a daily basis. He, therefore, called on the National Assembly which had protested against Melaye’s arrest, to use the opportunity to call on the relevant agencies to turn a new leaf. The activist said the National Assembly should give equal attention to the leader of the Islamic Movement of Nigeria, Sheikh Ibrahim El-Zakzaky, and a former National Security Adviser, Col. Sambo Dasuki (retd. ), who have both remained in custody for nearly three years despite several courts granting them bail. Falana added, “Even though the senator has my sympathy, it is indistinguishable that he has only been given a little dose of the humiliating treatment that is daily meted out to the flotsam and jetsam of our unjust society by the Nigeria Police Force and other law enforcement agencies in Nigeria. Meanwhile, the House of Representatives on Thursday issued stern warnings to security agencies, particularly the police, over Melaye’s life. Melaye, who represents Kogi-West Senatorial District, was said to have been driven in a police ambulance from Abuja to Lokoja on Thursday. He was taken on a stretcher into the Federal High Court in the town, where he was arraigned over gunrunning allegations by the police. The senator was later reminded in custody till June 11.